Each year we throw a themed birthday party for each of our children. They are nothing extravagant, and they are nowhere NEAR some of the parties you will find elsewhere on the internet, but the food, décor, and favors always coordinate with the theme. Even mid-sized home parties can get expensive quickly, but I have one surefire tip that ALWAYS saves me tons of money party planning. But… you might not like it. DECIDE ON PARTY THEME AT LEAST SIX MONTHS IN ADVANCE. It sounds impossible, but it’s really not. You already know the kinds of things in which your child is interested. Ask them 6 months out (or more) what kind of party they would like. If it’s not something totally outrageous, you can agree to the theme and then STICK TO YOUR GUNS. If he suddenly changes his mind 3 months before the party, remind him what you had already agreed to and suggest that you save his new idea for the next birthday (or his Halloween costume, or a homemade t-shirt, etc.). If you show enthusiasm for the chosen theme, he will reflect that excitement. Once you have a theme chosen, you will see how much easier it is to save money on the party when you plan way, way ahead. I you have ever browsed my Pinterest boards, you know that I have several different boards dedicated to themed birthday parties. I might not be throwing a party with any of those themes this year, but they are things my kids are just starting to get interested in, which means they may be contenders down the line. Meanwhile, it doesn’t cost me anything to pin the ideas for the future. Once I have a party theme firmly decided, that’s when the Pinterest boards kick into turbo. Instead of passively repinning when I come across a cool idea, I actively search out budget-friendly tutorials and pricier inspiration photos. This year’s Superhero Party and Seuss Party boards helped me hone in on things like menu, color scheme, and décor. Once I have a clearer idea of how the party is going to go, I can start looking for ways to save on anything I need to purchase. If you have found some amazing ideas and saved them to Pinterest, you still need time to craft them up. I am a big proponent of the “spend time, not money” philosophy, but you have to have the time to spend in the first place. If you only leave yourself a few weeks (or less) to get the party together, you will end up spending money instead of saving it by making things with your own two hands. But, be careful of the myth that everything that is homemade costs less, sometimes store-bought items can be the real money saver. The second benefit of knowing early on what your theme will be is that you are able to keep your eyes peeled for themed party supplies and catch them when they are SUPER cheap. 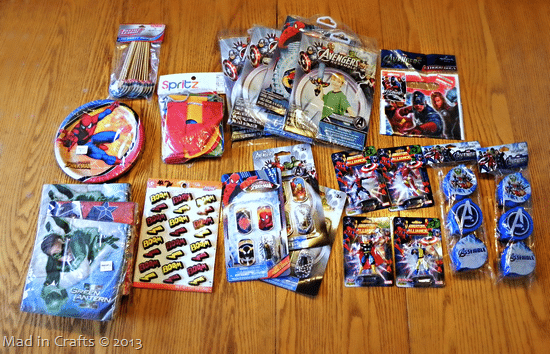 In the past few months, I have found all these licensed products for my son’s superhero party, one by one. The party won’t be until December but I have so much of my non-food shopping done already! Let’s break down where I found everything. Target and Walmart prices are generally already cheaper than those of dedicated party supply stores, but when those products then go on clearance the prices really drop. I (and my mom) found these supplies for much less than the original marked prices. I can already check buying half the dinnerware and all the treat containers for my son’s party off the party planning checklist. 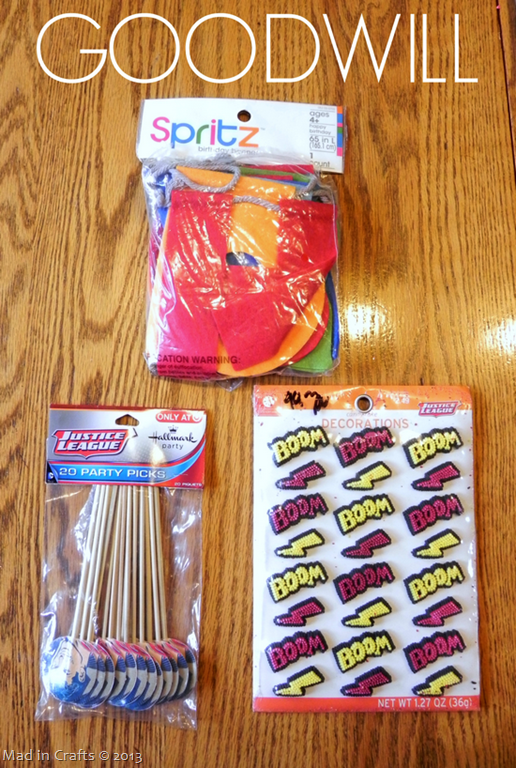 Dollar stores are also full of licensed party supplies, you just have to keep your eyes peeled. 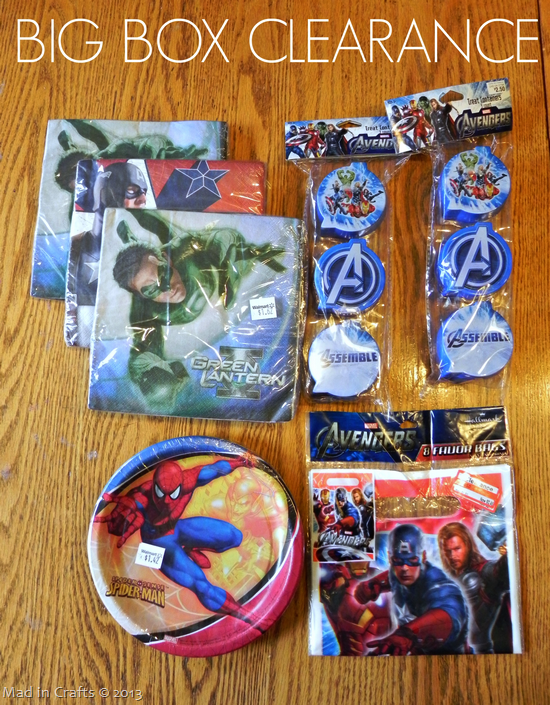 Since they have their Halloween costumes in stock, I found the inflatable superhero gear (on the bottom right) that should keep the munchkins occupied while all the guests arrive. 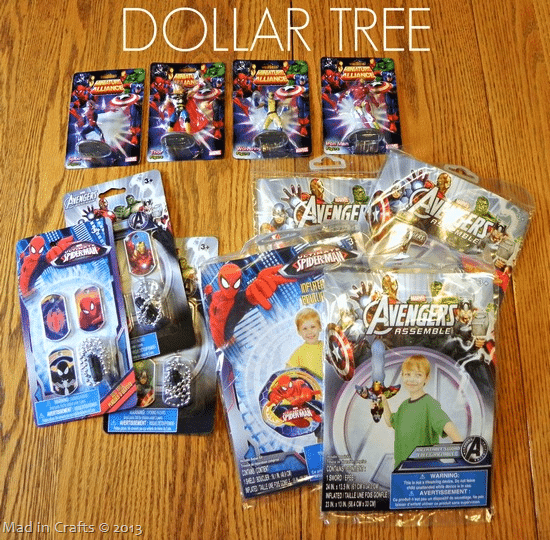 The superhero dog tags will go in the favor bags, and the mini superhero figurines can be used as table décor. If you have an eagle eye, you can even find new party supplies at Goodwill on the double cheap. I found decorations for the cake and cupcakes, and the felt HAPPY BIRTHDAY banner can be used for many parties to come. 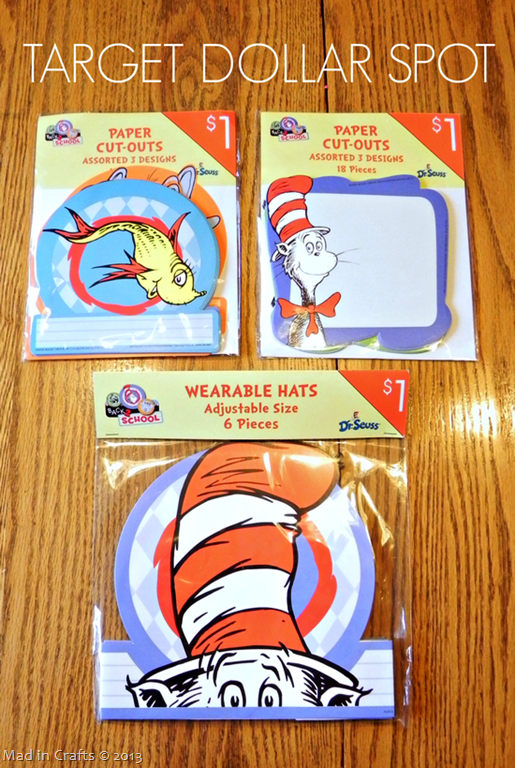 I didn’t find as many Seuss party supplies in my searches, but Target had these in their Dollar Spot just before school started. Originally meant for classroom decorations, I used them for décor, food signage, and party hats! Pre-buying party supplies doesn’t have to be limited to non-perishables. For example, if you are planning on serving hot dogs (like we did at both my son’s Baseball Party and my daughter’s Mickey Party) and you see hot dog buns on a super sale, buy what you need and throw them in the freezer till the party (or beg freezer space from a friend or relative). Procrastination breeds stress. Some people thrive on that pumping adrenaline and looming deadline. I do not. And, generally, budgets don’t either. Last minute purchases tend to have higher prices tags, as do stress-purchases. Save your sanity and your money by planning things out well in advance. Our kids’ birthdays are fairly close to Christmas, so during those last months of the year our pocketbook can get pretty strapped. By making small party purchases throughout the year, we can soften the blow on our bank account. 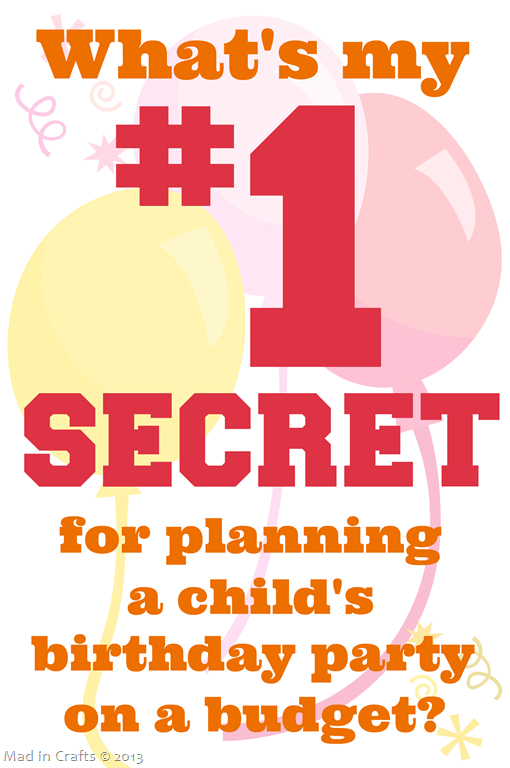 ONE LAST BONUS SECRET: YOUR KIDS DON’T NEED AN ELABORATE, GLITZY PARTY. THEY NEED YOU. This is hands-down the best secret I can share with you. When it comes down to it, your kiddos need to know how much you love them and how happy you are they came into your life. And no amount of helium balloons, frosting, or gift wrap can show that any better than a genuine adoring smile and a tight hug. So, if party plans or entertaining pressure get in the way of spending quality, happy time with your child, ditch it and don’t look back. And that’s a party planning secret you can share.